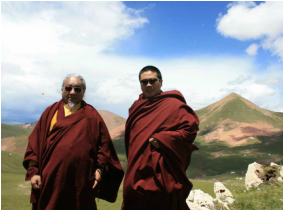 Lhö Ontul Rinpoche has been sharing his Lho Lungkar lineage with students in America since 2000 when he founded his Drikung Dzogchen Communities for the transmission of the unique Yangzab terma held in the Drikung Kagyu tradition. In order to facilitate the administrative needs of Rinpoche's centers, and to help keep Rinpoche in contact with his students when he is not on tour, Lho Rigdzin was founded in 2014. The goal is to help this unique transmission of the dharma flourish. The primary mission of Lho Rigdzin USA is to preserve and foster the continuation of the Drikung Kagyü Yangzab, Mahamudra, Kadampa, and other teachings for the benefit of all beings as taught by Lhö Ontul Rinpoche and Karma Ratna Rinpoche to their students in the United States. Lho Rigdzin USA will be the administrative body providing support for the study and practice of the confluence of Three Rivers of Lineage: Kadampa, Mahamudra, and Dzogchen. Because ours is a living dharma tradition, this means supporting the practice communities of Lhö Ontul Rinpoche’s lineages that have emerged and will continue to emerge in the West. The organization will exist to to maintain and propagate the teachings of this lineage and so that many beings will receive benefit. Lho Rigdzin USA has five primary functions in service to the preservation and continuation of teachings already given and with the Drikung lineage as a whole. Obtaining U.S. visas for travel and maintaining the records necessary to achieve this; and facilitating access to dharma resources for Lhö Ontul Rinpoche’s students. 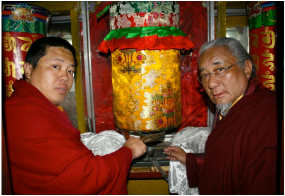 Facilitating access to dharma resources for Lhö Ontul Rinpoche’s students. strengthen the American sanghas’ relationship with Lhö Ontul Rinpoche’s monastery, Wogmin Thubten Shedrup Ling, in Tso Pema, India.